(CNN) -- Pirates hijacked a British-owned bulk carrier Saturday in the Indian Ocean, but NATO forces stopped an attack on another vessel in the Gulf of Aden hours earlier, NATO maritime authorities said. 11 pirates are arrested by Yemeni security forces in an operation last month. The UK cargo ship, the MV Ariana, was carrying 35,000 tons of soya about 250 nautical miles (287 miles) northwest of the Seychelles when it was seized around dawn. The crew members are Ukrainians and they are not believed to harmed, NATO said. It is unclear how many crew members were aboard the vessel and how it came to be attacked. NATO said it was unaware of ransom demands or any threats against those aboard. NATO said a European Union Protection Aircraft has been deployed to monitor and track the MV Ariana, which is making its way toward Somalia -- the epicenter of the pirate industry. The Seychelles is a republic consisting of a group of islands off East Africa. On Friday evening, a NATO operation conducted by a Portuguese warship disrupted a pirate attack on a Bahamas oil tanker in the Gulf of Aden. The tanker, the MV Kition, broadcast an emergency alert when a pirate-filled skiff approached. NRP Corte-Real, the closest NATO ship, and its helicopter responded and intercepted the pirates. Portuguese Navy special forces boarded a pirate mother-ship. They found and destroyed four AK-47s, a rocket-propelled grenade and four explosives. 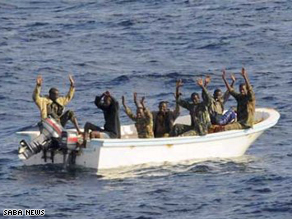 They seized 19 suspected Somali pirates but released them after consulting with Portuguese national authorities. Piracy has been soaring off the coast of eastern Africa -- particularly Somalia, which has not had an effective government since 1991. Somali pirates have defied foreign navies patrolling the waters and have collected large ransoms from shipping companies. Ransoms started out in the tens of thousands of dollars and have since climbed into the millions. Journalist Ashleigh Nghiem contributed to this report.